People tend to restrain small and medium-sized dogs with force due to their size, which causes them to struggle defensively. The result: procedures take longer and patients become more difficult with each visit. In this lab, you’ll learn a variety of holds and be able to identify the directions of movement they control. This will allow you to adapt quickly to the situation and to the dog’s response. Patients who otherwise would be difficult to handle will now be calm and cooperative. Learn 5 methods for controlling the rear end and 7 methods for controlling movements of the front end. 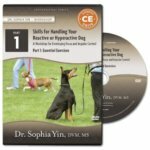 Determine which directions (front, back, left, right, up, or down) each hold controls, and practice adapting to the dog’s movement by switching between holds. Discover how to safely pick up small dogs who are friendly, but wiggly, as well as those who are aggressive. Evaluate which restraint hold is best for a given dog and procedure. Know how to determine, based on the dog’s body language and behavior, when to choose something else.